Ecuador Times: "Alvaro Noboa Thanked for An Artwork Donation"
El diario virtual Ecuador Times, realizó un artículo sobre un evento del Abogado Alvaro Noboa. 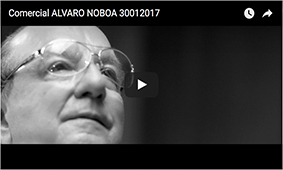 Alvaro Noboa, Founding President of Luis Noboa Naranjo Museum, gave an acceptance speech on Thursday night. He thanked Panama Ambassador, Roberto Ruiz Diaz, for the donation of an artwork by Aristides Ureña Ramos.